The characteristics that make women good wives can be different from what they need to succeed at work. As a result some women constrain their ambition and ability. The research started with a survey on “ambitious” behavior. Their criteria included asking for promotions and negotiating for raises. They also involved whether the students would have offered to present sales pitches and actively participated in meetings. Using participation grades from professors, the researchers wanted to see if the single women were more quiet. In two other exercises, they asked questions about career preferences that related to work hours, willingness to travel and salary. For each of the approaches, a statistically significant proportion of the single women demonstrated less ambitious career goals when told that men would know their response. Answering the survey on ambitious behavior, single women showed they were less likely to boost a career through leadership roles. In class, the single women were less likely to volunteer. And when similar groups of single women responded differently to the same questions, it all depended on whether men would know their answers. If answers were shared, then single women had less of a tendency to say they would work more than 50 hours a week. They also expressed a willingness to limit travel. The non-single women? Their response resembled what the men said. The men? Their relationship status did not correlate to their answers. 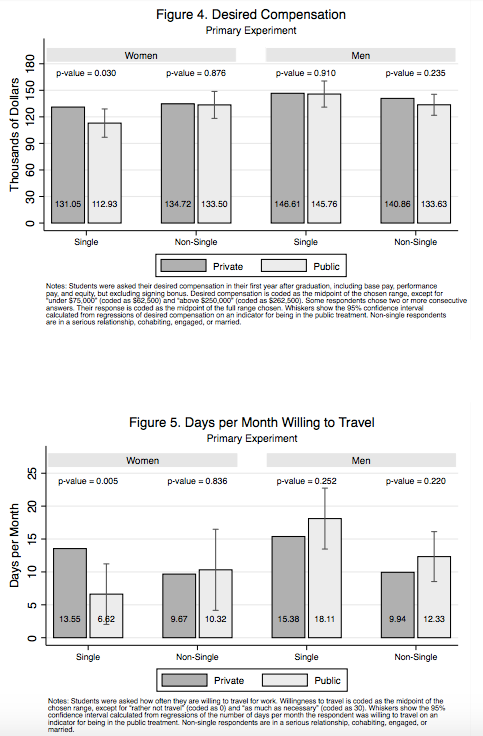 It is possible that some women who want to marry face a tradeoff. Choosing between labor market and marriage market success, they have to decide the signals they send to potential mates. Sadly, they might be responding to reality. In one study, men attending Columbia University said they preferred women who were less ambitious than they. My conclusion? Some of our very talented human capital is underutilized. My sources and more: Thanks to marginal revolution for alerting me to “‘Acting Wife’: Marriage Market Incentives and Labor Market Investments” from U. Chicago, Harvard and Princeton scholars. Moving beyond, you might also want to read a study of divorce rates for female CEOs.